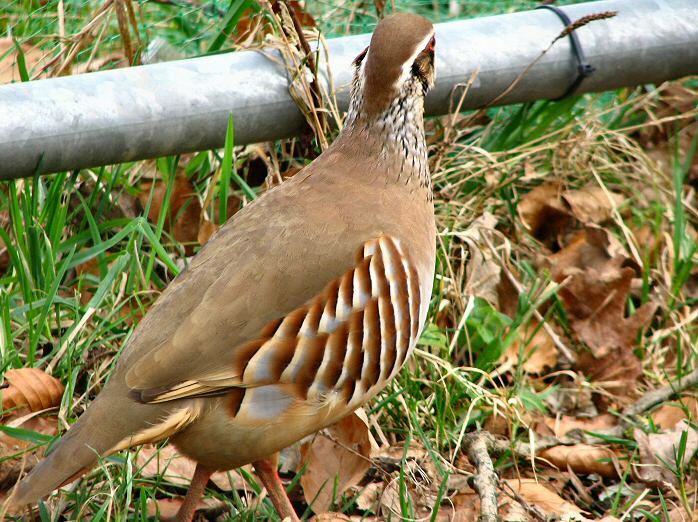 Introduced to Britain in the 1600s by Charles II, the Red-legged Partridge now outnumber our native Grey Partridge. It is bigger than the Grey Partridge and is a colourful game bird. Both sexes are alike with grey-brown upperparts, black flank stripes, a chestnut sided tail, a large white chin, a black throat necklace with a white stripe above and a black stripe beneath the eye. As is obvious from its name it has red legs together with a red bill and eye ring. The young can be confused with young Grey Partridges. They mainly eat seeds and roots but will also take insects especially when feeding young. They are unusual in that the female may build two nests and lay a clutch in each. After hatching the male and female take care of each brood simultaneously and independently of the other brood. They usually can be seen groups in open fields and their nests are similar to those of that of the Quail and Grey Partridge, a shallow hollow lined with plant material on the ground in scrub, hedgerows or arable fields.